Over the past decade Branson, Missouri has become a leisure hotspot. Branson is located in the heart of the Ozark Mountains, an area whose history is steeped in craft and folk traditions brought by settlers from the hills of Kentucky, Tennessee, and the Carolinas. Part of its allure for musicians is the area's rich folk music and the artistry of instrument makers. Because the Ozark settlers were virtually isolated from other communities for so many years, their traditions marinated undisturbed. What visitors experience there is a remarkably preserved and living history, and Branson has cultivated a family friendly environment so there is no shortage of attractions for the entire family. Though Branson's image as a tourist attraction and entertainment industry base has become burnished to a fine luster mostly in the 1990's, its founding fathers in the early 1900's quickly realized its potential as a resort area. Today, Country and Western performers from around the world entertain thousands of families at Branson's many stages and theaters. Branson regulars Joe Tinoco and Tamra Holden host "Magnificent Country". The "Magnificent" theme culminates on Saturday nights with "Magnificent Saturday Jubilee", which combines elements from the "Magnificent" shows. The shows are reasonably priced for the whole family. Part of the fun of these shows is the variety. Each "Magnificent" show includes costume changes, comedy, and lots of musical fun. "Magnificent Seven" is an award winning variety show that performs musical genres from Country to Big Band, and Broadway show tunes. Amanda won Branson's "Young Entertainer of the Year award, and the show itself has won the "Best New Show of the Year". 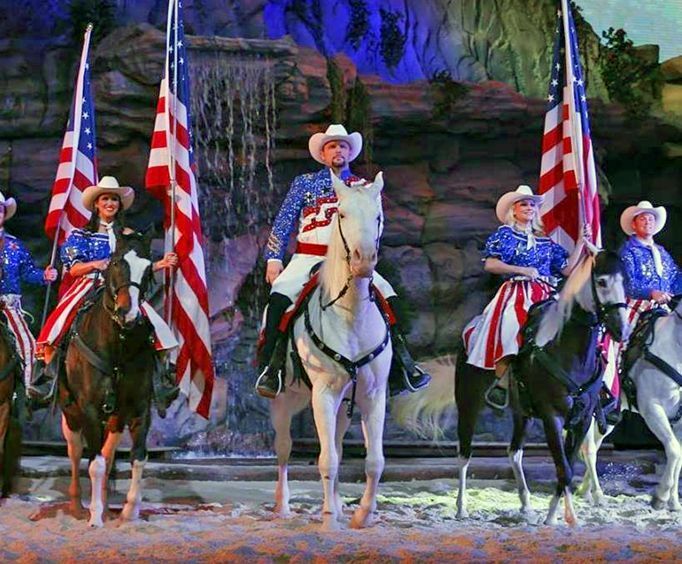 With two shows daily, except Wednesday and Saturday, it's convenient to catch "Magnificent Seven" during a Branson visit. "Magnificent Country" performs daily also, except Monday and Saturday, and has two shows on Wednesday. In addition to hosting and singing duo Joe and Tamra, there is comedy and dance with Nellie Norris, and singing by Josh Carroll. "Magnificent America" shows daily, except Sunday, at 10:00am. It's an entertaining history lesson and a tribute to America's Veterans. The Saturday night Jubilee combines talents from of all the "Magnificent" shows, and is also occasionally broadcast on television. This culmination showcases all the fun and excitement of the White House Theater shows. The White House Theater also has a gift shop where visitors can purchase memorabilia of "Magnificent" shows, such as performance videos, and other Branson collectibles. Another allure of the theater is the "Magnificent Sweepstakes". Visitors who sign up can win a car, fishing boat, or big screen television. Besides the shows, the biggest attraction is the theater itself. Branson has become known as the home of America's Veterans, and the White House Theater is a fitting venue for some of Branson's most patriotic shows.